Summertime in the Mediterranean brings back so many memories from when I was young. The freshest seafood prepared simply and elegantly. 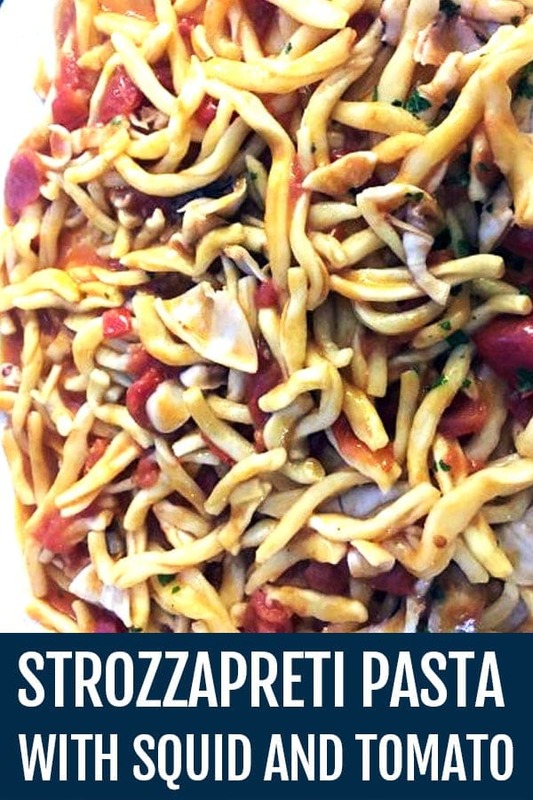 Not a long time ago at the fish market, I saw these beautiful squid and thought about creating a recipe that mixed up many regions and flavors from Italy: from Tuscany, handmade Strozzapreti pasta, which translated means “priest strangler”, combined with squid from the Sicilian coast and tomatoes from the Campania coasts. Here’s the recipe for you to try it out! 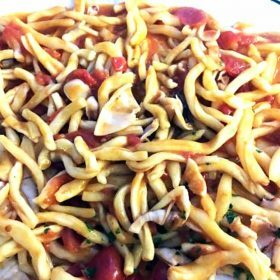 This recipe combines products from different regions of Italy to create a delicious and fresh pasta recipe. 1/4 cup dry white wine preferably Pinot grigio. Don’t use Chardonnay! In a 12-inch skillet, heat the olive oil. Add shallots and sauté until translucent, add garlic and stir to combine. Add parsley and basil and stir to get the flavors out. Add the diced tomatoes and chili flakes, let the tomatoes cook for about 5 minutes until some water has evaporated. Add salt and pepper. Add squid and stir, add the wine and let them cook for about 8 minutes, stirring continuously, do not overcook or they’ll get rubbery. Let sauce reduce and water evaporate about 2 minutes. Bring a large pot of salted water to a boil over medium heat. Add pasta and cook until al dente. Cook it for about 8 or 9 minutes if dry or 3 or 4 minutes if fresh. Drain the pasta, transfer into the pan with the squid sauce. Turn on the heat on medium and mix it all together. Raw squid is tender, but if cooked improperly it loses its tenderness. 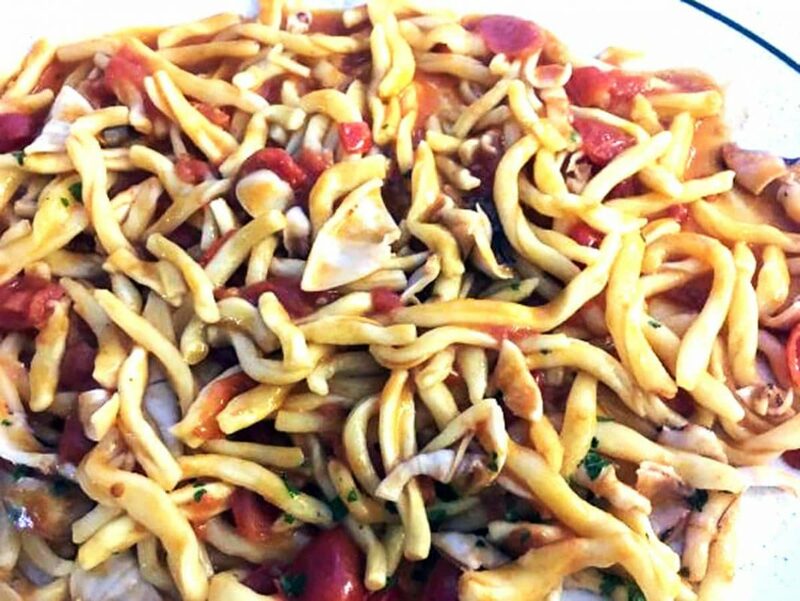 To keep its tenderness, squid must be cooked either very briefly over a strong flame, or when it is fried or grilled for a long time –45 minutes or more– over very low heat. Any other cooking procedure produces a squid with rubbery consistence.